As local traditions in Okayama prefecture would have it, Momotaro is the story of the triumph of a local folk hero called Kibitsuhiko-no-mikoto, who overcame an evil prince of Kudara (who is identified with the Baekche kingdom of Korea). According to local legend, Kibitsuhiko-no-mikoto is equated with Momotaro, and Ura is called the defeated devil and the still extant Korean-style villa where he was said to have lived, is called Kinojo “The Castle of Evils” a full scale Korean style mountain castle surrounded by the castle wall whose total length is approximately 3 km. The foundation rocks for castle gates, flood gates, and warehouses were discovered. Judging from how the Momotaro myth is one of the most popular and entrenched of Japanese folk myths, it suggests that Kudara princes were seen, at least in certain parts of Japan, as evil and disliked by the local folk, to be revolted against. Above: Kinojo is the place where Ura is said to have lived. The castle is a mountain fortress built against the Onino-sashiage-iwa rock outcrop and the foundation rocks for castle gates, flood gates, and warehouses have been uncovered. A grotto on top of a mountain approximately 3 km away from Kinojo is called the house of Ura and was made by building up rocks into a series of dolmen-like tiers. Momotaro is a symbol of Okayama. “The Ura Myth” is the root of an old tale, “Momotaro”, which has been passed on orally from generation to generation in the Kibiji District. The Kibiji District is an area with majestic ancient history and legendary stories. The myth of Kibitsuhiko-no-mikoto and Ura passed down through the years, is said to have been the root of an old tale called “Momotaro”. The myth is as follows. “The Prince Ura of Kudara (Baekje: A country that existed from the 4th to 7th centuries in what is the present day Korean Peninsula), used to live in Kinojo (castle of the devil) and caused trouble for the people living in the village. In order to defeat Ura, Kibitsuhiko-no-mikoto was delivered to Kinojo by the emperor’s government. After a blistering battle, Ura was defeated by Kibitsuhiko-no-mikoto. 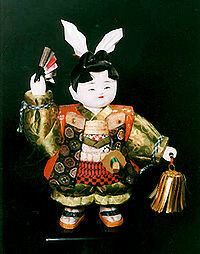 In the old tale “Momotaro”, Kibitsuhiko-no-mikoto is portrayed as Momotaro, and Ura is portrayed as the defeated devil. We speculate here whether the reference to the house of Ura here could have referred to The Story of Ural-batyr, a folktale that came from Mongol-Turkic parts of the Ural mountains of Central Asia via the Silk Route, thus pointing to the origins of the migrating Ura (Mongolic-Turkic) princely clan from the Ural mountain area; the tale also involved the clash between a folk hero and a devil, and the story adapted and merged with the local Momotaro tale. The identification of Ura as a shapeshifter with his carp totem supports his northern Eurasian origins. 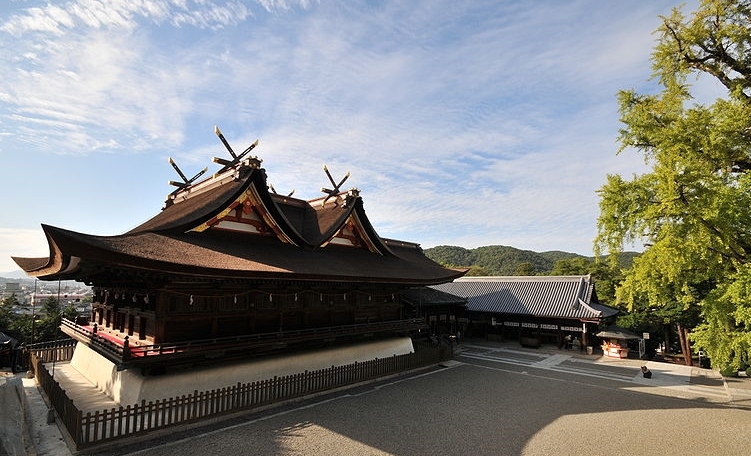 The Momotaro myth has been recorded in the Ozaki collection here as Momotaro, or the Story of the Son of a Peach. Momotaro is also associated with other locations in Japan, such as Megijima, an island in the Seto Inland Sea near Takamatsu, see Megijima (Onigashima) and Momotaro.